Today I have 2 cards to share with you! I know I spoil you!! Lol!! Well I was lucky enough to choose the theme over at Craft your Days away challenge for this fortnight, now bear in mind I chose the theme quite a few weeks ago! and only yesterday did I realise it is in fact challenge 50! so we have 50 - shades of grey!! Oh plus one other colour!! Now I did try to read the much vaunted book and I have to say... Sorry I don't get it! maybe I'm old fashioned, but I would rather my hubby say he loves me, than tell me to kneel by the door with my hands tied, and call him sir!!! Anyhoo I digress! So this week over at CYDA challenge as I said we have shades of grey and one colour! I chose shades of grey rather that black and white because I wanted to play with mixing the different copic greys together! I really enjoyed playing with the greys, I have coloured Bea with warm greys and her clothes with neutral and toner greys! the pinks are R20,21,11 and 00, the sentiment is Magnolia. I am getting more and more into the CAS look, although it can be suprisingly difficult, there is truly nowhere to hide, any smudge or mistake can't be hidden under a convenient flower! Although the odd crystal can be a life saver!! you will see in my next card!!! So over at Basic grey challenges the challenge this fortnight is things with wings! and don't forget you have to use a basic grey product! Now you will see just how much I enjoyed my greys! This time I played with adding different colours! It has to be said they both look better in the "flesh" but I love them both!! notice the abundance of crystals!!! say no more!! Lol!! for this card I used the lovely Scarlets letter papers by of course basic grey! and the sweet fairy is LOTV! there is a lot of glitter on this card, on the dandy lions but unfortunately it doesn't show up!! So Lots of shades of grey maybe even 50!! Papertake weekly - all things girly - either card! 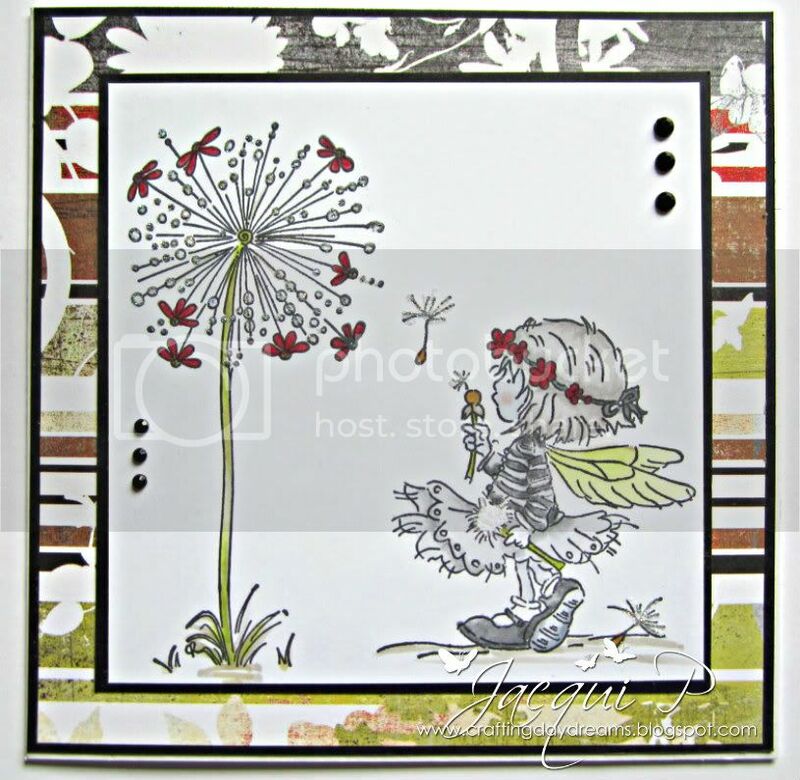 stamptacular suday challenge - wings and bling - fairy card! Have a great Saturday peeps, see you tomorrow with my Totally Tilda midweek reminder! They are both stunning, I love the cute Teddy Bea, and your monochrome LOTV is fabulous with that splash of red - the huge 'dandelion' head is ispired!!! Two beauties Jacqui and I just love the shades of grey with your pink its divine!!!! Love the shades of grey - really makes a darling card! Thanks so much for joining us this week at the Stamptacular Sunday Challenge! Thanks for joining our All things girlie challenge at PTW with these two gorgeous cards! Lovely cards. First is my favourite with this gorgeous grey-pink colours and sweet teddy. 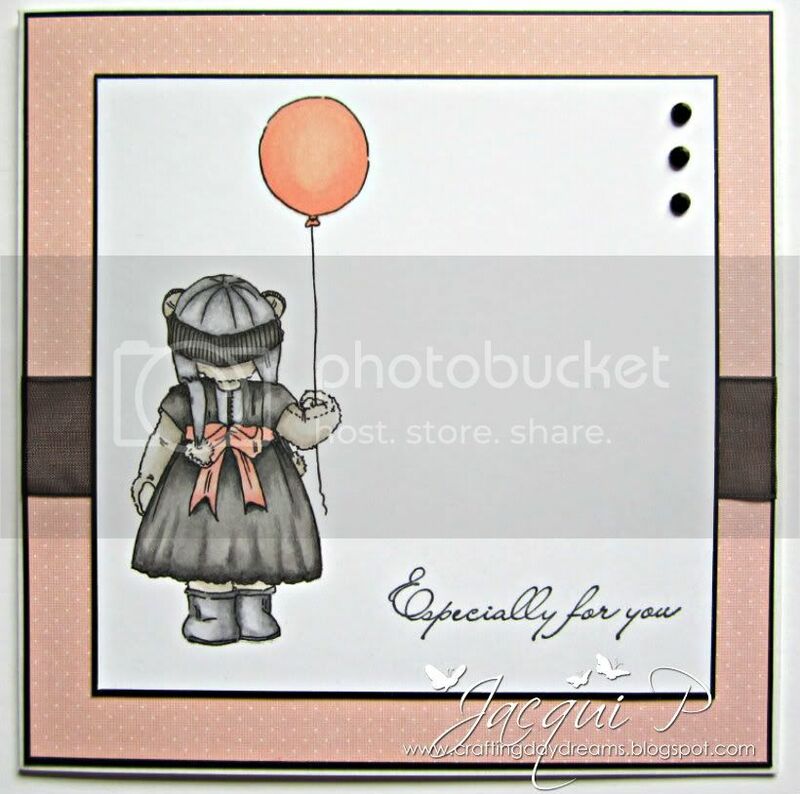 Thank you for joining us at Sweet Stampin` “Monochromatic” Challenge and we hope to see you again soon. Wow! Lovely cards, simply but fantastic! Thanks for joining us at Deep Ocean this forthnight. totally tilda - summer fun! A very merry un-Christmas to you! Totally Tilda - beside the seaside or sea! !